Paul Mac - Stand and Deliver! I’ve been accused of being a silverchair fan, and believe me, there are many worse things to be accused of. My infatuation with silverchair stems from the fact that they began as teenagers with that very teenage ambition of being in a band. The difference is, they pursued that dream and turned it into a reality. Furthermore, beginning essentially as a grunge band (earning the ridiculous epithet, way back when, of ‘Nirvana in pyjamas’), they showed a credible development from each album to the next. Now Daniel Johns has stepped away from carrying the responsibility of the band, to collaborate with Paul Mac. When silverchair were thrashing noisy, distorted guitars, Paul Mac was twiddling knobs to create a distinct electronic sound with Andy Rantzen in the musical entity Itch-E and Scratch-E. Who’da thunkit, some ten years ago, that in a decade’s time two very different musicians would meet somewhere in the middle? 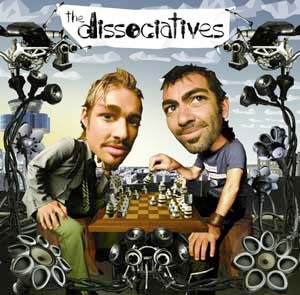 As The Dissociatives, an association of two distinctly different musical entities, Daniel Johns and Paul Mac create a very futuristic and yet retro sound. Sure, a fair amount of knob twiddlege takes place (on the synth, I mean; I’m not accusing anyone of self-indulgence) but a lot of the time the synth is a mellotron making flutey sounds, along with the odd cello or brass sound, not unlike classic ‘summer of love’ Beatlesque pop. Mac admits that this is mostly because Johns has this classic early-model synthesizer in his basement, so when melodies were being written for this album, they were usually worked out on the mellotron (while Johns strummed his ‘weird chords’, no doubt). However, truth be told, there has always been a lot more to Paul Mac than merely generating electronic sound; he has worked with Daniel Johns on a couple of silverchair albums, and he also served as the musical director of the comedy/current affairs quiz show Good News Week (the Aussie equivalent of Have I Got News For You). An interesting coincidence is that Mac’s real name is the same as that of the host of Good News Week: Paul McDermott! The interview went to air on Saturday June 19 2004 on ABC NewsRadio. Here’s the MP3, if you’d prefer. Soundbite: ‘Young Man Old Man’ from the album The Dissociatives. Demetrius Romeo: Daniel, Paul, how did the collaboration that became The Dissociatives come about? DANIEL JOHNS: Me and Paul were just friends for a while and really liked working with each other, because Paul had worked on some silverchair demos with me and played piano on some tracks. We really liked what each other did so we wanted to work together in a band together and write an album together and make something really enjoyable. PAUL MAC I had admired Dan’s stuff for years and we had a similar sense of what we liked about music, I think, and when we were doing the Diorama demos, it was such a fun process of Dan showing me his weird chords and song structures and me mapping it out and fleshing it out on the piano; it was just so much fun, that whole process, that we started writing stuff together – one track – at night while we were doing that. It felt like so much fun that we wanted to do more. Demetrius Romeo: Daniel, this feels like the natural progression; why isn’t the Dissociatives album a silverchair album? 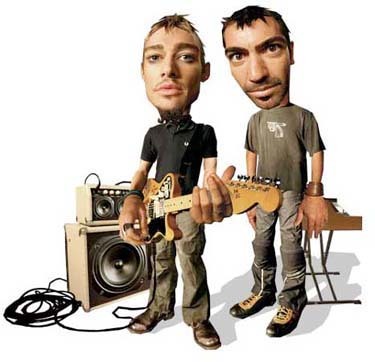 DANIEL JOHNS: Um… because it’s me and Paul! It’s like, I don’t know, it’s good to… I just wanted to write with someone else for a while, have some fun collaborating, because usually, with silverchair, I’m doing it on my own. I just wanted to find someone that I felt confident writing with and really like Paul as a person as well, so we could write together comfortably. Demetrius Romeo: Paul, did you ever imagine that you’d be collaborating with Daniel Johns? PAUL MAC I didn’t really imagine it, but it kinda still makes sense because I’ve always loved music in all forms; I love rock music, I love classical music, I love electronic music – just anything that is interesting and takes you to a more interesting kind of headspace. And even when we started working together on this, it wasn’t trying to bring rock and dance together or anything, it was just more finding what we had in common musically that we loved and exploring that. Demetrius Romeo: Well, you did start at totally opposite ends of the spectrum when you began your careers. Daniel, when did you have any idea that you might be moving closer towards the centre and collaborating with your diametrical opposite? DANIEL JOHNS: I think when I heard Itch-E and Scratch-E for the first time, I really wanted to work with Paul. I really wanted to work with whoever was responsible for whatever made you feel like ecstasy was coming on even when it wasn’t. Paul’s bleeps and tweeps always did that for me. I’d be in my car just driving somewhere to work and next thing I know, I’d feel like a pill was coming on. That was pretty gear! So I wanted to work with him. Demetrius Romeo: Paul, one of the things your credited with in the sleeve notes of the album is ‘freak dub atmosphere’. How do you conjure that up on stage? PAUL MAC It’s a different approach on stage than it was on record. On the record it’s like painting with lots of different sounds and reverb and changing the source of the sound and turning it into something new. In the live show it’s a different approach: it’s trying to get the same feeling, but not trying to replicate the sound. DANIEL JOHNS: Yeah, I think it’s more organic, live. It’s the same with guitar effects and drums and bass; everything’s straight through the instrument, but you’ve got to figure out some way to make it not sound natural. You don’t have effects pedals that you have in the studio and things that you can EQ. You can’t fiddle as much. It’s just really kind of… I don’t know how to say it, but you’ve just got to be really strict in how you use your limited effects to make everything sound different. Demetrius Romeo: Would you see a time when you’d release a live Dissociatives album if what you’re doing on stage is different enough to what you do in the studio? PAUL MAC I always find live albums somewhat disappointing, but occasionally one will come through that sheds new light on the songs that makes it worth it. Most of the time it just feels like a slightly out-of-tune version of the album with crowd in the background going ‘aaaaaaaaaaah’. DANIEL JOHNS: That’s what I think! I don’t really like live albums either. But sometimes they’re really amazing. Soundbite: from the album The Dissociatives. Demetrius Romeo: Is the Dissociatives a side project, the first stage of the next phase, or a destination you intend to stay at for a while. DANIEL JOHNS: I think it’s the first stage of the next phase, really. It’s like a turning point – me and Paul wanted to clear our respective heads and to do something fresh. It’s also somewhere we’re going to come back to, because it feels really good to be here, so we’re going to keep reverting back to it whenever we need a sanctuary from our respective projects. Demetrius Romeo: So that doesn’t rule out the continuation of silverchair as an ongoing project. DANIEL JOHNS: No, that doesn’t rule anything out. The idea is never to rule anything out. PAUL MAC Exactly. It’s a healthy, collaborative thing. I think that music is unfortunately set up where you have your one band and your one idea and you milk it endlessly, whereas I think, with this approach, it’s more like a continuing musical friendship. You still go off and do your other things, but you come back to it and it’s cool; it’s a freshening up of musical ideas.